Are you a 'disruptive talent' like Sir Richard Branson? Sir Richard Branson freely admits that he would be a difficult employee for any boss to manage. One of the UK's best-known and wealthiest entrepreneurs, he says that if he were a member of staff at another business, his line manager would have to "accept that I might not do things exactly as he'd like me to do them". But Sir Richard adds that the company in question would still need "to be nice to me", despite the disruption he would inevitably cause. He says he'd tell them: "If you don't deal with me well, I'm going to go off and set up my own business and I'll end up competing with you." He'd say: "Look after me, respect me, and accept that I'm a square peg in a round hole." While Sir Richard might sound like many managers' idea of a nightmare member of staff, he wants companies - of all sizes - to hire more independently minded, rule-breaking, stubborn people like himself. His argument is that the new ideas and drive that such mavericks bring to a business far outweigh the fact they may often be difficult to work with. In a world that already has plenty of business buzzwords and phrases, a new one has now been coined to describe such people - "disruptive talent". The description has been developed by business psychologists OE Cam, which recently held a discussion on the topic in London. Martyn Sakol, managing partner of OE Cam, says that a person with disruptive talent has a multitude of positive attributes that they can bring to a business. "I would define disruptive talent as individuals who think and act differently, innovate, challenge conventional wisdom, spot trends, see commercial opportunities, and tenaciously find ways to achieve success," he says. However, he stresses that such a person needs to be robustly managed, to prevent things from going wrong. "Disruptive talent can derail, you need to make sure employees are properly supported, both when they're working individually, and as part of a team." One UK company that has signed up to the new disruptive talent mantra is UK animal feed business, AB Agri (ABA). Its chief executive David Yiend says his business has been actively recruiting such people for the past year. So what does ABA say in its job advertisements? "We stress that we're looking for candidates who will be provocative, unbending, and relentless in their pursuit of the goal," says Mr Yiend. "They have to be prepared to argue and debate, not just accept the norm." But once you have recruited self-consciously idiosyncratic talent, how do you integrate them into your workforce? And crucially, how do you make sure existing employees are not annoyed or upset by the influx of awkward people? Mr Yiend says you simply keep them apart. "The point is you don't integrate as such," he says. "You manage individuals differently, but with everyone working towards a set of common goals. "It is vital that everyone's clear on what the company's vision is, and then as a team you can succeed." But can hiring disruptive talent cause more problems for a business than the benefits such people provide? Business psychologist Stuart Duff says it is certainly an issue that firms need to be aware of. "The term disruptive talent is an interesting rebranding of people with an identifiable character, people who we have been working with for many years to try to help them better understand the impact they have on others," says Mr Duff, who is a partner at UK business psychology consultancy Pearn Kandola. "We do a lot of coaching people like this, people who are very bright in a particular role, very inventive and creative, but who have no chance of fitting into the wider culture of the business. "As a result, other people in the organisation cannot cope with the amount of antagonism and disruption they bring with them. That is why people who you can classify as disruptive talent tend to instead start their own businesses." 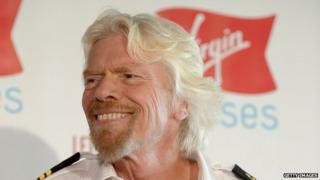 Sir Richard Branson, who has an estimated net worth of £3bn ($4.5bn) has certainly thrived running his own businesses. He says: "I think anyone who sets up a business is to an extent a disruptive individual, because starting a business is simply someone thinking 'I can do it better than anybody else, and I know how to do it'. "For that idea to succeed you have to be doing it in a disruptive way, otherwise you're just doing the same as everyone else and you are going to fail. "When I came up with the idea of starting my airline and space company, people gave me every reason why I shouldn't do it. In the end you have to be a leader, you have to give it a go." Additional reporting by Will Smale.